At an exhibition held last year at Neuburg an der Donau, the chief work in focus was a 15th-century Bible, the Ottheinrich Bible. 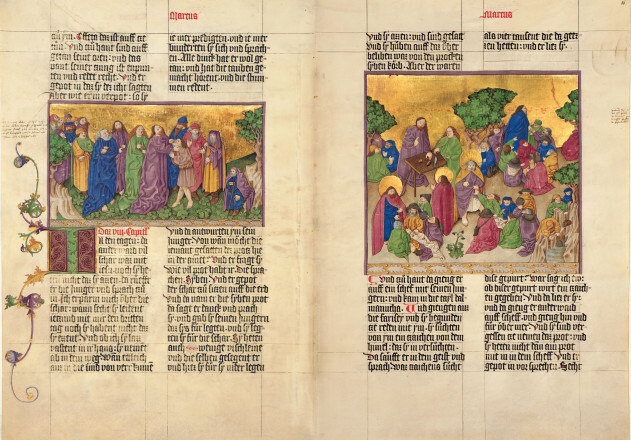 Regarded as the earliest surviving illustrated manuscript of the New Testament in the German language, it was originally commissioned around 1430 by Ludwig VII, the Bearded, Duke of Bavaria-Ingolstadt. It was illuminated by three Regensburg painters, but its decoration remained unfinished - only to be completed by the artist Mathis Gerung in 1530–31. The manuscript was later split up into eight volumes, and after a rather complicated history, now all of its parts are at the Bavarian State Library in Munich - on their website, you can browse the digitized volumes of the Bible. The exhibition, titled Kunst und Glaube, contained lots of interesting objects, as far as I can tell based on the catalogue. I was most interested in objects dating from the period of Ludwig VII of Bavaria (Duke of Bavaria-Ingolstadt between 1413-1447), a contemporary of King and Emperor Sigismund, and a noted patron of the arts. Perhaps the most well-known of his commissions is the small-scale model of this tombstone, made by Hans Multscher around 1435 (Munich, Bayerisches Nationalmuseum). This tomb was never executed in full size. 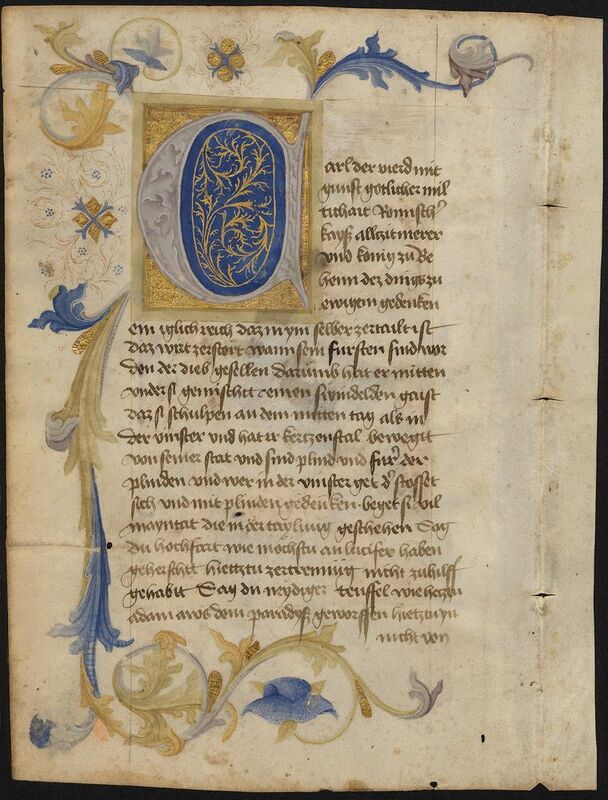 The Ottheinrich Bible was also one of his important commissions, which remained unfinished. 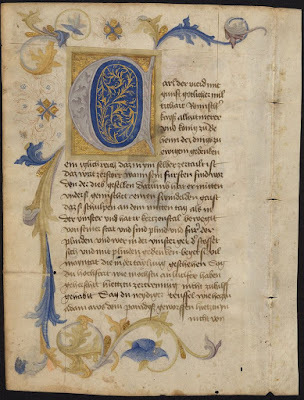 One of the objects in this section was a fragmentary manuscript of the Golden Bull of Charles IV, which was illuminated by the workshop of the Ottheinrich Bible (the so-calle Matthäusmaler). The manuscript was executed in Regensburg, and its surviving fragment is kept at the Town Archives of Ulm (See catalogue record). The fragment was identified as dating from this period by professor Robert Suckale, who provided a study about the Ottheinrich Bible for the catalogue (and also contributed to the catalogue entry in question, cat. no. 5.18). The fragment consists of only three leafs, containing a German translation of the Golden Bull issued in 1356. 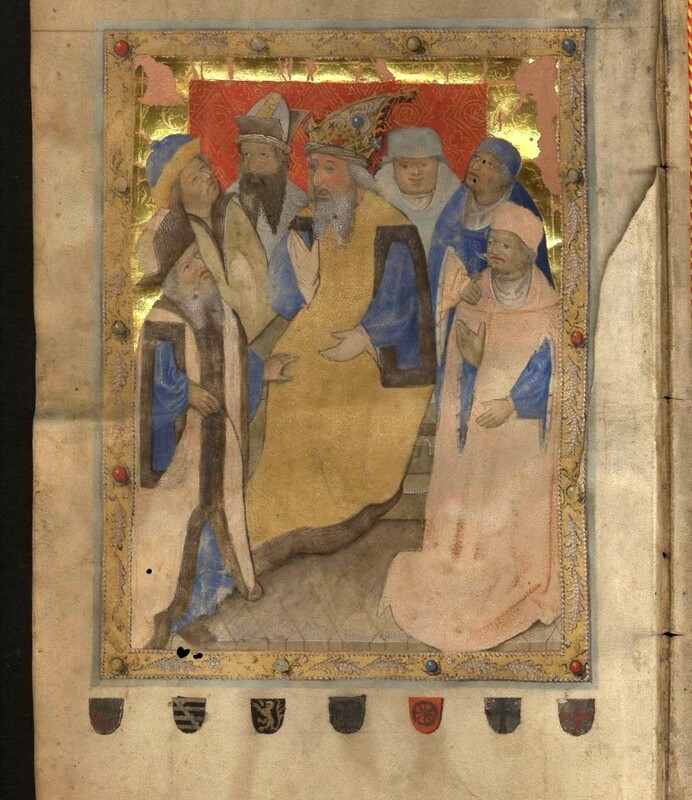 On the verso of the first folio, a group portrait of the Holy Roman Emperor with the Electors is depicted (see above). As Sigismund was also the King of Bohemia from 1419, only six Electors are depicted around the Emperor. On fol. 2r, the fragment also includes the full page depiction of coat of arms of a certain Hans Kastenmayer of Straubing - an image very similar to those included on armorial letters issued by the imperial chancery at that time, and the fragment also contains a nice initial. The big exhibition organized to commemorate the 600th anniversary of the Council of Constance opened last weekend at Constance. One of the central figures of the exhibition is Emperor Sigismund, who was also the King of Hungary. 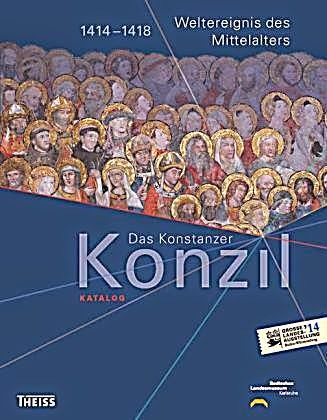 However, Germany celebrates a number of other Holy Roman Emperors this year with major exhibitions - here is an overview. Charlemagne (Karl der Grosse) - First on the list is the first emperor of the Middle Ages, Charlemagne. He died in 814, so 1200 years ago. To commemorate this event, three major exhibitions will take place in Aachen in 2014, dedicated to the culture and courtly life of Charlemagne. The trio of exhibitions will be opened on 19th June 2014 by their official patron, the Federal President. They will run from 20th June to 21st September 2014 in three prestigious venues – the Coronation Hall in Aachen’s Town Hall, the Centre Charlemagne on the Katschhof, and the Cathedral Treasury – and will present the impact, art and culture of Charlemagne. You can find more information on the three exhibitions and the three venues, as well as on the Route Charlemagne Aachen on the exhibition website. You can also have a look at this press release announcing the exhibitions (pdf). The second emperor to be commemorated is Louis IV, called the Bavarian (Ludwig der Bayer), who ruled from 1314 until 1347. 'Ludwig the Bavarian. We are emperor!’ will be the title of the upcoming Bavarian Regional Exhibition which will tell the fascinating story of the first member of the House of Wittelsbach to ascend the imperial throne in Regensburg. The occasion is the 700th jubilee of Ludwig’s coronation as King of the Romans in 1314 (he was crowned Emperor in 1328). For the first time a large exhibition will focus on this important ruler of the late Middle Ages. The exhibition grants the visitor an insight into the history of the Bavarian duke, German king and Holy Roman Emperor and the time between 1300 and 1350, during which Bavaria became the center of Europe. The exhibition will be at the Haus der Bayerischen Geschichte in Regensburg, and will be on view from May 19th until November 2, 2014. The churches and smaller museums of the town will also serve as exhibition venues. Finally, I would like to return to the exhibition in Constance (Konstanz), which is on view from April 27 until September 21, 2014. 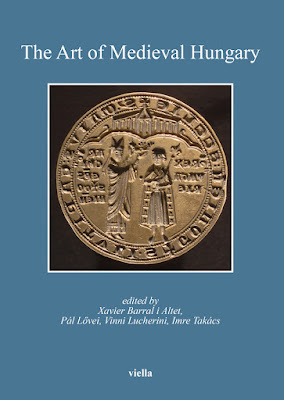 2014 marks the 600th anniversary of the beginning of the Council of Constance. The Council was a major event in church politics which made Constance the center of European politics and a meeting place of European cultures in the years 1414-1418. 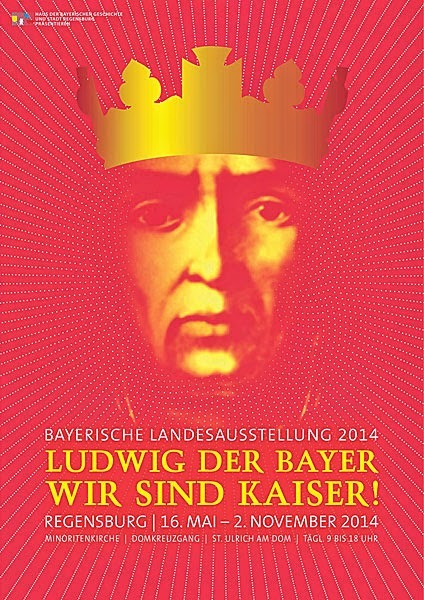 Baden-Württemberg commemorates the anniversary of the world event of the late Middle Ages with a Great State Exhibition. 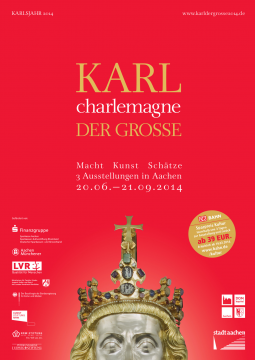 The exhibition was organized by the Badische Landesmuseum in Karlsruhe. The main figure of the Council was Emperor Sigimund, who ruled as King of Hungary from 1387, and was elected King of the Romans in 1411. He ruled until 1437, and was crowned Emperor only in 1433. The exhibition is on view in the actual building in which events took place in Constance. I will report on the exhibition and the accompanying publications in more detail soon (and you can also read my preliminary report). A website has been set up for the series of events during the next four years, and also for the exhibition itself. In the Battle of Lechfeld, King Otto I defeated the Magyar troops in 955, effectively putting an end to the period of Hungarian invasions to western Europe. The battle took place near Augsburg, but its exact location was not known. According to German press reports, a sensational find may change that. 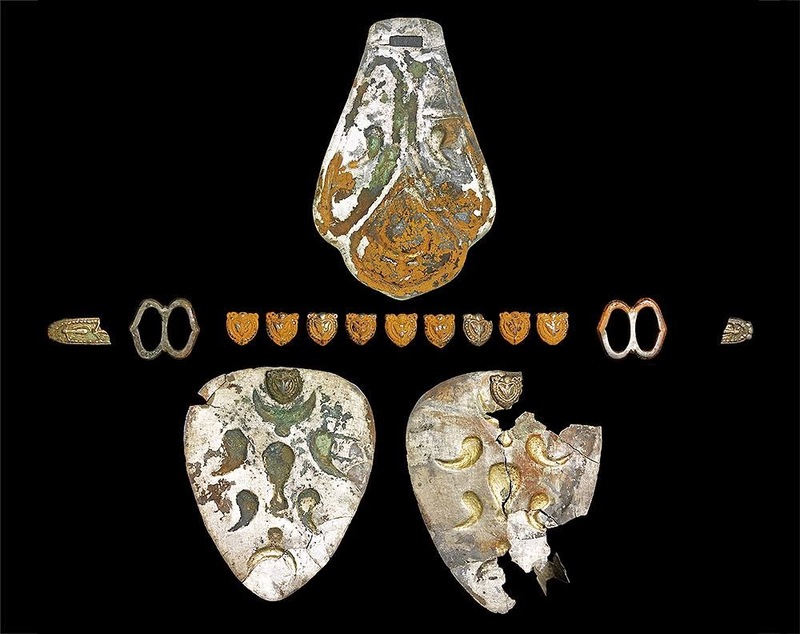 An amateur archaeologist found a set of horse ornaments at a site some 15 kilometers northeast of Augsburg. 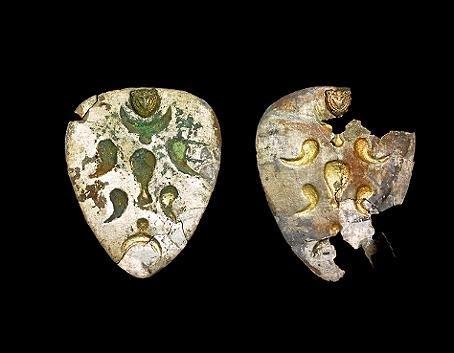 The silver ornaments show traces of gilding, and their style unmistakenly ties them to 10th century Hungarians. The ornaments must have belonged to a high-ranking leader in the Hungarian army. The leaders of the army, including Bulcsú and Lehel (Lél) were executed by Otto - who himself was later crowned Emperor. The Hungarians turned towards east during the next few decades, being involved in conflicts against the Byzantine Empire. Finally, however, the period of Hungarian raids was over, and a new kingdom emerged in the Carpathian basin under the rule of King St. Stephen (1000-1038). The finds were presented last week by the Archäologische Staatssammlung München. Further excavations to be carried out at the site may shed more light on the circumstances of this decisive battle. The finds will be presented at the permanent exhibition of the State Archaeological Collection after restoration. You can read about the discovery in Augsburger Allgemeine (in German) or in Népszabadság (in Hungarian). More information is available at the following sites: Bayerischer Rundfunk, Focus, Aichacher Zeitung, usw. 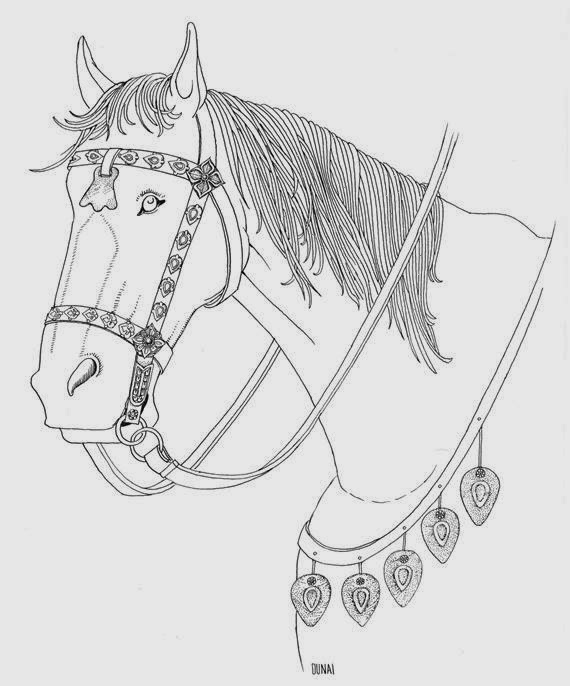 Drawing of Hungarian conquest-period horse ornaments.